It was a dreary, chilly, wet day the second time Mr. B and I made our way through the gates of Four Mile Farm in Ball Ground, Georgia to meet with farmer, Allison Bryant. Definitely not the bright sunny day with glistening green pastures and spring lambs that we had experienced on our last visit just a few days earlier. The sheep were still in the midst of lambing season, but, on this day, we were not there for the lambs. Allison had invited us for a different purpose. We were going to the slaughterhouse. Many of our discussions with farmers involve the fact that most people are disconnected from their food sources. Some of this disconnect is because of a lack of interest in the subject or a distance from the farms. Most people are content to purchase a bag of greens or package of shrink-wrapped lamb or beef at their local supermarket and not consider where it came from. As one of my readers commented on my first article about Four Mile Farm and lambing season, “There is a certain irony with seeing all these gorgeous pictures of sweet little lambs, and adorable little Gwen and Allison, strolling amongst and cuddling with the dear little lambs…and then…raw lamb chops being marinated in garlic and olive oil and rosemary and then seared over an open flame…” Do people really want to look at the newborn lamb pictures and then see us firing up the grill to cook loin lamb chops in a recipe at the bottom of the post? Do they really want to know what happened to the lamb in order for us to be able to eat the chops? My father hunted and fished when I was young girl. While this was sport to him, we ate everything that he killed, including pheasant, venison, other wild game and fish. To this day, I’m still somewhat traumatized by the vision of a doe strapped to the top of his car after one of his hunting trips. I was not fond of venison and was convinced he shot Bambi, but that doe was soon supper. We never wasted any animal or fish that he shot or reeled in. The site of the dead animal made us more aware of the fact that this was a living, breathing thing that died for our sustenance. When Mr. B and I received a late-night call from Allison asking us to travel with her early the next morning, I had mixed emotions, but we were impressed with her operation and her compassion toward her animals and knew this would be an important experience. She was taking in one of the cows we had seen just days before, fondly known as Buffalo Cow. We would watch the process of loading up the cow at her farm and then take him to the slaughterhouse. We headed to Ball Ground, Georgia early the next morning. Purchasing a package of ground beef in the grocery store is something I have not done since I learned about corporate farming practices. That one package of meat could be sourced from as many as twenty cows from as many as three countries (usually the United States, Canada, and Mexico). 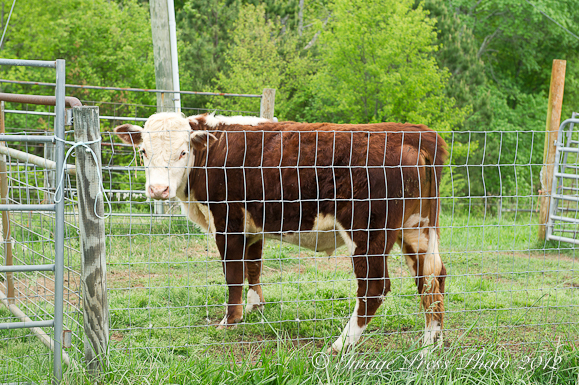 Do you know how those twenty cows were raised and treated up until the day they were processed? There are countless horror stories of corporate farms and inhumane conditions and methods of treating and slaughtering these animals. I never wanted to think too much about this topic until I started visiting family farms, talked with the farmers, and got close to these animals. I look back at that day when we took Buffalo Cow to the slaughterhouse. I cannot tell you that I cried or felt ill. I felt sad. Mr. B was sad. Allison was sad, too. Her little girl was with us on the trip to the processing facility in Ellijay, Georgia. It is part of life when you live on a farm and raise animals for food. You love them and give them the best life possible while they are on this planet. When it’s time to take them in, you do it as calmly and humanely as possible and you go to a processing facility that upholds those same standards. It is important to lower the stress of these animals during the transition. It affects both the humanity of the process as well as the taste of the meat. Allison separated Buffalo Cow from the herd the day before the trip. Buffalo Cow had bonded with one of the other cows, so the two were moved together and stayed together overnight until it was time to load the trailer, in order to keep him calm as long as possible. 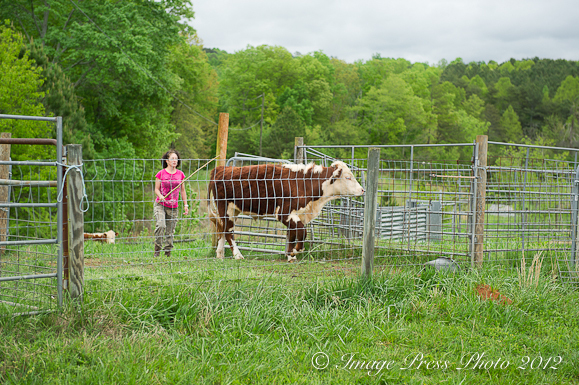 As Allison loaded Buffalo Cow into the trailer, it was difficult to see him taken away from the cow that he had bonded with during his time at Four Mile Farm. They wailed out to each other. The cow that was left behind was released in the pasture with the rest of the herd and kicked and bucked as it went off to find the others. It was a heart wrenching experience for me. 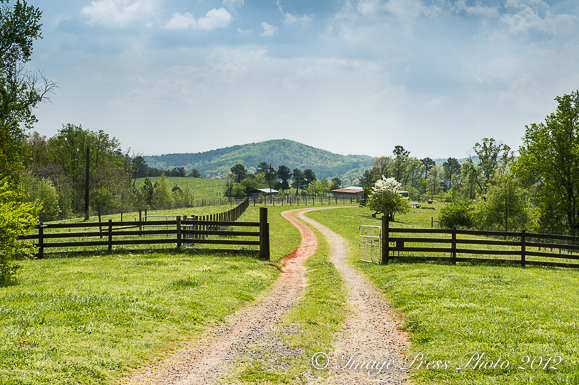 The ride to Ellijay is about an hour’s drive from Ball Ground. I was surprised by the size of the facility. It was small. They only handle about twenty cows per day. 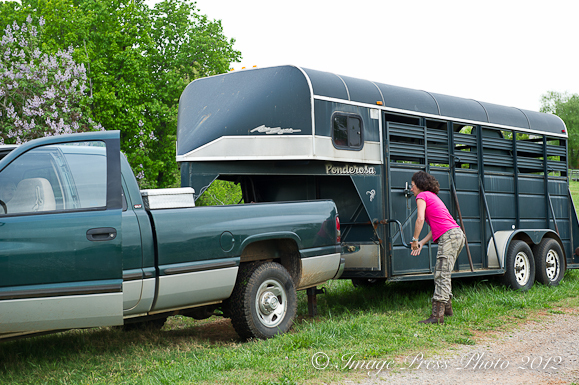 Allison backed the trailer up and Buffalo Cow walked right into the holding pen to be greeted by a much larger cow that was “waiting her turn.” Buffalo Cow seemed calm as he stood there while the trailer pulled away and the gate closed on the pen. David, the owner of the processing facility, came out to chat with us. He explained the process the animals go through and told us they had just been approved by Whole Foods Markets as a humane facility. It is a small business run by a family that has been farming and raising animals for many years. Allison will return to the facility in about two weeks to pick up the cuts of beef and ground meat from Buffalo Cow. She keeps some of the meat for her family and will sell the rest at two nearby Farmers’ Markets. While we did not see the slaughter itself, we did see the next steps in the process with other cows. We were not allowed to take photos during our visit and I am not sure showing them here would be appropriate. I was surprised at the amount of unusable and inedible parts that come from a cow. Due to Mad Cow Disease, any parts of a cow’s body associated with the nervous system are considered hazardous waste and must be treated and disposed of as such. We got back in the truck, hauling an empty trailer, and headed back to Ball Ground. Arriving home later that evening in Atlanta, there was a piece of local grass fed beef that had been cooking in the sous vide for forty-eight hours, awaiting us for dinner. We started the cooking process long before we knew we were going on this trip. Will I continue eat beef? Yes. 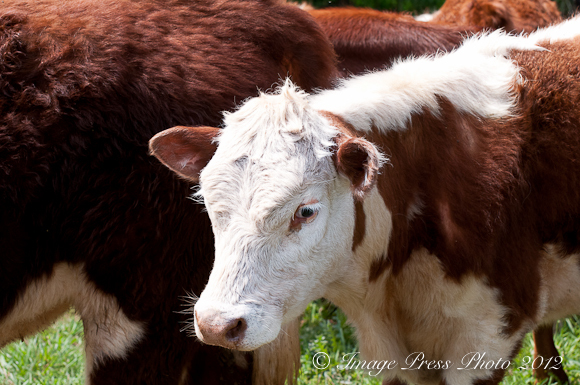 Am I okay with slaughtering animals for food? Yes, as long as they are raised humanely and their life is treated with compassion and dignity to the end. When I go to the market, I purchase local meats and I make a concerted effort to know the farms and their practices. My gratitude and respect for these animals began with our visit almost two years ago to Carolina Bison. Looking in to an animal’s eyes and feeding it by hand knowing that it will soon give up its life to feed you, is a truly humbling experience. I saw Buffalo Cow’s eyes that day we took him to Ellijay. I know where that cow came from. I saw the kind of life he lived at Four Mile Farm and traveled with him to where he spent his last several hours. I am okay with that. Gwen, you mention an unexpectedly important point about the unusable/inedible parts of a cow. This involves more than just the nervous system – think lungs, spleen, bladder, intestines, tendons……. That stuff has to be disposed of, unless a company is selling to the pet food industry. From the perspective of livestock producers and processors, the pet food industry serves this valuable purpose. From the perspective of people who feed paleolithic diets to their pets, these parts are inexpensive and vital. And if no one uses it, people do worry about what goes into landfills. Unfortunately, the internet being what it is, there are many who say that “by-products” (which is the legal designation for such cuts of the animal) are ‘fillers’ and not valuable nutrition to the animal. Our local chefs have done a great job of marketing the use of the whole animal, but they only get the stuff that’s considered appropriate for human use. I hope you can advocate for ‘by products’ contained in the pet foods marketed by ethical companies. Not only are those cuts appropriate for dogs and cats, use of them for this purpose is environmentally critical. Of course, cheap pet foods contain more by-products that come from CAFOs, and that’s not recommended either – they are nutritionally inferior and bad for the environment.. But the expensive pet foods don’t dare use these cuts because government regulations require that they be labeled “by-products”. There HAS to be some reasonable middle ground! Thank you so much for commenting on this subject. We did have a conversation with the owner of the facility about the fact there are many parts they cannot use for human consumption from the animal. As all facilities, they are under strict FDA guidelines (their inspector was there as we pulled in). They are a small operation and not certified for processing some of the by-products. David did explain that other facilities are able to do that. While I have often recognized the distance we have between the convenience of the food we purchase and the reality of what that means to provide that food; reading this story was heart wrenching. My ex-husbands family raised a cow each year that was slaughtered at the end of the year. I could never understand how they could do that; I thought I would get too attached and I probably would have; this is not something I could do like Allison does. But the answer can’t just be that we as individuals will know the source of our meat and therefore not feel any personal sense of guilt about what we are eating. Something realistic has to be a part of this discussion because with 300,000,000 people in this country I just don’t believe a lot of foods would be affordable to a majority of the population if our food products were all grown and raised as we would personally prefer. Grass fed, organic, free range…all great terms but limited to a very few. I would love to see conversations include solutions to affect real change; because I believe the truth is we simply can not feed the people of this country without factory farming so the real need is to bring a greater sense of humanity and responsibility to that front. How do we also educate those that shop at Walmart to demand that the foods they eat are treated ethically and with decency. That seems to be a real crux of the conversation. IMHO. Yes, I do agree that there are large numbers of people to feed in this country. However, I think we need to begin to think more in terms of feeding a community rather than a nation. If we start small and people begin to demand more local and better meats, chicken and produce, I think we can forge change. Many small farmers do not make money. They barely break even and as Allison pointed out, many of them have second jobs to support their families (as they do). All of the regulations and cost of feed, fuel and buying the animals makes it nearly impossible for a small family farm to stay in business. The new Farm Bill is also going to put the burden on smaller farmers who will now have to jump through hoops to label their food, yet another expense. Do you know there is a bill sponsored in many states now (and being pushed by lobbyists) where it would be a felony to take pictures on farms? Meanwhile, in Canada, the Canadian Farm Council encourages people to come visit. The want to open the barn doors and have a discussion. In this country corporate farms are trying to close their doors. What are they trying to hide? If we all start to support smaller farmers and demand humanely treated animals, I do think the prices will come down. Just because you are a large scale operation, does not mean you cannot handle animals humanely and thoughtfully. Many of the farmers at local Farmers’ Markets do sell at lower prices than what I pay at Whole Foods. We were shocked at how reasonable this processing facility sold their pork products for. It was much lower than Whole Foods and I am certain even Publix. There are smaller producers that are making their way in to larger grocery chains now because people are demanding meats and eggs from animals that have been raised in more humane conditions and without antibiotics. While they may cost a little more, I think it’s a choice we have to make. I get very frustrated when I am in the store and see mothers with two kids in tow loading up their grocery baskets with expensive processed foods like Doritos, pudding cups, boxed noodle mixes, etc. That stuff is not inexpensive. They could buy real food to feed their families for less money. Part of this is the lack of education on nutrition, lack of concern or even laziness. It’s just not that hard to make a roasted chicken and some fresh veggies. This is a lifestyle choice that we need to continue to educate people about. This is what the Lets Move! initiative is trying to do in our schools. Such a great post. I am currently trying to find some farms in my area that I could get meat from. Where I know that the animals have been treated the way you talk about in your post. Farmers selling their meats, chicken, eggs, etc. may be at local Farmers’ Markets in your area. You could also look into CSA’s. I hope you find some great local sources. If not, many grocery stores are now carrying smaller producer meats, chicken and eggs that are raised in more humane conditions and without antibiotics. I hope heaps of people comment on this post because we must take animal welfare into consideration when we buy our food. Not just because we demand humane treatment but also because what we eat affects our health. When I started raising my own chickens for eggs and saw how cute and individual their personalities were, I could never ever buy a caged egg again. Now that I have no chickens of my own, I found a local person who raises her own and I buy from her. I would love to say I could haul my animals to slaughter but I honestly don’t know if I could. My ex father-in-law raised beef in Tennessee and he couldn’t eat his animals. He and his next door neighbor used to swap. I thought that was really odd but it’s how they dealt with making pets out of their animals. I wholeheartedly agree with you. I think that so many of our illnesses are related to the food we eat and the choices we make in purchasing that food. I hope more people will comment and get a discussion going about this issue of food for health. It is a huge passion of Chef Ming Tsai’s. What the Chinese have known for thousands of years, is just now being discovered in other countries. We often talk about getting a small farm and while I would love to raise chickens for eggs, I am not sure that I could do anything else with them other then let them live a long life. I would also make any animals we purchased pets and would probably let them graze away until a ripe old age. I would personally not be able to take in my own animals for slaughter, but would like to have neighbors that raise animals for food. That would be the best of both worlds. I love the idea of swapping the meat. That is a great way to handle the personal side of this issue. Thank you for your comment. Living in France where people are much closer to the source of their food changed my whole way of looking at it and understanding it. And when one goes to the butcher’s one sees whole chickens with head, feed and feathers, whole rabbits even lambs and veal. People are not afraid to know they are eating animals. The first time JP came to the US and we went grocery shopping he was stunned! He stared at the beautiful meat under plastic wrap and said “you Americans don’t want to know you are eating animals!”. And the French are really conscious and knowledgeable about what gets put/pumped into and fed to their animals (especially after Mad Cow Disease) and where the animals come from. We do appreciate our food more because of that, I think. Excellent, excellent and very important post, Gwen. Thank you! I agree that it is very different in other countries. The larger grocery stores here make everything so sterile. It is interesting to go to some of the ethnic markets or butchers where you see meat hanging and get a better connection to and knowledge about what you are eating. I do believe you have a real appreciation for your food, as you mention, when you have a more personal connection to it. Ok, this beautiflly written piece made me tear up a little, especially the part when the cow was separated from her bull, her life long mate, and they called out to one another. Keeping this short and sweet because I’m one of those people that can’t handle some stories about the beef industry..and prefer to remain ignorant so I can still eat my steak with pleasure. The cows were both males, so they were friends and not mates, but yes, it was sad to see. I think it is a good reminder that animals have feelings, too and that while many are raised for food, they still deserve to be treated humanely and with dignity. A few posters commented that it must be hard to eat animals that you’ve raised. I will try to give you a little insight….First and foremost, I love all the animals on my farm and I take the best possible care of them I can. I spend a lot of time with them and really enjoy being around them. They live as nature intended, out in large pastures, relaxing and chewing their cud. They are healthy and happy. You can tell by their shiny, rich colored coats and clear, alert eyes. I also love my family and try to take the best care of them I can. That includes providing the highest quality food. 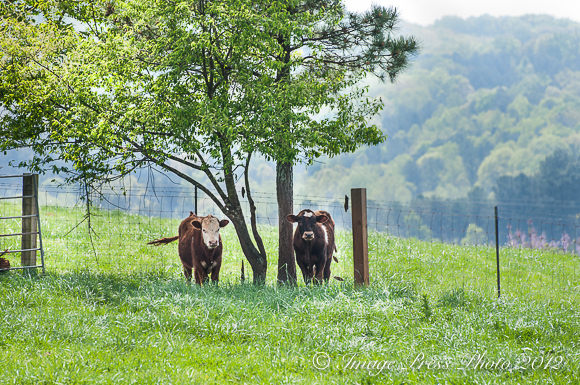 I am fortunate that we have land and I am able to provide grass fed meat to my family. For years my husband has been plagued with health issues, mostly auto-immune related (triggered by an intolerance for wheat). For the past several years, he’s been eating mostly paleo. He’s tried really hard to get healthy by cleaning up his diet instead of taking the drug du jour. This includes eating ‘healthy meat’. (And yes, grassfed red meat is actually healthy for you! It has almost as much omega-3 fatty acids as fish and is very lean.) We also have a 6 year old daughter that we are consciously trying to teach good eating habits as well as showing her where food comes from. (The comment about kids eating lots of processed foods is so sadly true. Most kids think food comes in fancy packages with a cartoon character on the front.) So yes, I am sad when we bring a steer in for processing. But as a mother and wife, I am happy and fortunate that on a daily basis I’m able to provide such quality food for my family. It boils down to being able to take care of my family and for that, I am grateful to my animals. As far as the comment about using all the animal….I bring home everything that is allowed by law. (As a side note, everything we bring home is consumed. We don’t bring in another cow until the freezer is almost empty.) I have 9 dogs and I use bones to keep their teeth clean. Also, beef broth is made out of other bones (grassfed bones make great paleo broth!) The heart, kidney, spleen and liver is either purchased for human consumption (made into some sort of pate), purchased by pet owners who feed raw, or we feed it to our chickens (who love it, believe it or not!) The hide of the cow is sold for leather to go in cars. The excess of hide as well as some other parts are shipped down to Florida to be used as fishing bait. (The excess consists of feet, head, lungs, tendons and intestines. Since cows are ruminants, they have a lot of intestines full of semi processed grass, including 4 stomachs.) So while there are some unused parts, a majority of the cow is used. The other thing to consider about factory farming is that our food is so convenient. While organic produce in the supermarket is expensive and available to purchase by those who can afford it, hardly anyone has a garden these days. (When I was growing up, most people in our neighborhood had something growing in their back yard.) Now we just go to the supermarket and pick out what we want. There is another way to get quality produce….grow it yourself. We don’t spend time preparing a garden in the spring, tending it through the summer and reaping the benefits. Instead, we spend our time surfing the internet or watching Dancing with the stars. We need to go back to a less convenient way of living where we grow and prepare our food. Yes, it takes time. But you get better food and some exercise while you are at it! Working in the garden is also a great family activity. Unfortunately, it’s not as easy for Gwen to go visit a factory beef farm. I think that would have been a good contrast to her visit to my farm. However, you can get an idea of what it’s like in the movie ‘Food Inc’. If you haven’t watched it, I encourage you to. Yes, factory farming is a way to provide cheap food, but there are so many other costs that I never imagined. This movie brings it to light. After watching that movie, I haven’t eaten any red meat that I didn’t know. Thanks again for coming out to visit. Quality food is our passion and we enjoy sharing! Thank you so much for your thoughtful comment and response to the post and other people’s comments. You are certainly the best one to address these questions/concerns since this is your farm and what you live and do every day. I hope that some of the answers you have given here give more insight to my readers. I know that I learned other information from reading your response, including the use of some of the other parts of the cow. I hope that addresses Dr. Wynn’s question as well. I am also glad that you pointed out the health benefits of eating grass fed beef. I think, unfortunately, most red meat is considered not to be healthy, but grass fed beef is different and we include it in our diet. I would also like to mention that while I did not know what to expect that day, I thought the whole process was very humane. Your processing facility does a great job of handling things. I am not sure that even if I could get in to a larger facility that it would be something I would care to see. Just as you mentioned, Food, Inc. has given many of insight into a very grim industry. Thank you again for sharing what you do with us. As with all of our visits to farms, it has made a real impact on our lives. Growing up on a small, family farm I learned to respect the animal, many became pets (to me), and then eating it. It was just understood that is was part of the life cycle. I can still remember watching my dad kill a hog and hang it in a tree, skin rabbits (I was partial to my furry friends), flapping chicken without heads, and numerous other lessons learned about where things come from and the natural order. Simple lessons like cows eat grass, not corn or soybeans, yet they are gorged with grains in commercial feed lots just before slaughter. Chickens that are allowed outside eat bugs, which makes their eggs more nutrient balanced and better for us to consume. People spend money on what they value. Processed foods, dining out almost daily, the lure is convenience and it is a thief in the end. Fast, cheap, and easy rules the day and there is nothing fast, cheap, or easy about farms. Making arrangements to pick up raw milk or farm fresh eggs, seeking a local farmer for meat from animals free from hormones, antibiotics, and inhumane treatment all takes time and effort. Until the expectation and demand shifts, it sill unlikely change. There is no easy fix, but I do believe education is vital, which makes posts like yours so important. Thank you for your comment and for sharing. You could not have said it any better. Gwen – thank you for a very thoughtfully written post about what I believe is an important topic. I grew up the daughter of a farmer in a very small farming community. We always had cows, pigs, and chickens on the farm and although the herds and flocks were for profit, they also supplied our family’s kitchen. We also grew a huge vegetable garden every year. This was common practice throughout our area. Every summer was spent harvesting and preserving the garden’s bounty and the fall was time for butchering. There were two meat processing facilities (that’s what we called them rather than slaughterhouses) in the county and they easily served all the farming families. There was always food in the freezer and pantry and we generally knew where every bit of it originated. Now that family farms are nearly a thing of the past, I find it very difficult to find locally grown food. Even though I live now in the north metro Atlanta area, sources in my location are scarce. True, there are some farmer’s markets, but times and distance make them impractical. I would love to see interest in opening smaller, locally run and owned grocery stores that would stock locally sourced foods. I believe it’s an idea that could be very successful. As far as the process involved in taking an animal from the farm to the table, being a country girl, I know the score and so long as the animals are treated in a humane way, it doesn’t bother me. It’s simply part of the cycle of life, but I understand others’ sensitivity to it. Thank you for your comments. Life seemed to be much simpler then, wouldn’t you agree? While I grew up in the city, as I mentioned in the post, many of the proteins we ate came from my dad’s hunting or fishing. The fish he caught and meat he killed were stored in the freezer for use throughout the off seasons. You mentioned what is available (or not available) in your area and of course, in Atlanta proper, there are options between Whole Foods and a few Farmers’ Markets. Sometimes great produce and meat is local and sometimes not, as you know. However, I do enjoy a couple of markets in North Georgia and Cashiers, North Carolina. The produce is spectacular and they either grow it on site or get in in several times a week from local farmers. It is worth a weekend drive in the summer. They also sell local beef. Thank you Gwen. That was a hard post to read but so important. Good work. Great article, thanks for taking the time to share your thoughts and experiences! There is a new website, FARMetarian.com, that is all about living and eating cruelty-free. You (and your readers) may be interested in checking us out! We are trying to build a directly of farms (and retailers/restaurants) that sell humanely raised meat and animal products. I will add Four Mile Farm today :o) We’ve also got other info/news/etc on the topic of treating the animals we use for products humanely. Go vegan. Stop the murder of billions of animals. Stop the animal holocaust. See the real world. The madness of some of these posts. Animals are equal to humans. Murder is murder. What world are you people living in? Your comment came in as spam, but I wanted to address your remarks, regardless. Yes, I am sure many people feel this way about animals, however, animals have been used as food for humans for thousands of years. I am most respectful of animals as are the majority of farmers that raise them. While you may not agree with eating meat, that is fine and we will agree to disagree. My point in this article was to discuss the fact that humanely raised animals that are treated well their entire life are a very different topic than the large corporate farm-raised animals that are not treated well. That is what needs to change. I admire you on many levels, Gwen, not the least of which is the courage it took to write this article. I am with you: I’m not ready to turn into a vegetarian, but, I admit that the thought of the reality of the situation (that an animal has given its life so that I might continue to enjoy the kind of food that I enjoy) is troubling to me on a personal level. As I think you know, we eat a lot of game around here. One time, when my husband’s hunting buddy got back from a big hunt, he had a video that a friend of his had taken on the hunt, and asked if my husband and I would like to see it. I reasoned to myself that as I was a hunter’s wife, it was time for me to “man up” and toughen up about the hunting process. I told him to go ahead and show us the video, and that I’d be glad to watch it. I found myself extremely disturbed by the kill. I think shopping at supermarkets all my life has led to a disconnect for me, and it’s a disconnect I’m grateful for. I’d rather be removed from the reality of the kill. Still, as I believe I mentioned last time, how grateful I am for farmers who raise animals in humane conditions, and honestly? If I’m going to continue to eat meat (and I AM) I really prefer that they be taken by a hunter. I’d rather that their death be quick, sudden, and a surprise. Not something they fear or dread. Call me a wimp. I’m good with that. I also question my choices some days in regards to eating meat. I think that is natural if you love animals and care about their well-being. I do know that I feel better when I eat red meat and always have. I gave it up for one year at college and did not feel good at all. That is my body and I am sure there are plenty of arguments out there against what I just said, but that is how I felt. I also enjoying cooking with meats and that will never change. I understand your opinion on hunting versus processing plants. Smaller and humane facilities do a better job than others in not stressing the animals out. If that works for you and your family to eat more game meat, I completely understand. I met at Whole Foods a few mths back a family member from a farm that sells grass-fed beef to WFM (they are right outside of Florida in GA). Talking with her w/my daughter by my side about their cows and how they are fed and treated was enlightening. I’ve seen Food, Inc. many times and it could turn you off consuming meat/chickens for the rest of your life. There are places where animals are treated in a more humane place. There needs to be more. This is touching and not easy to read and I’m so happy you shared it with all of us, Gwen.